Welcome to the fifth book report for #BookbedReadsPHLit this 2017! 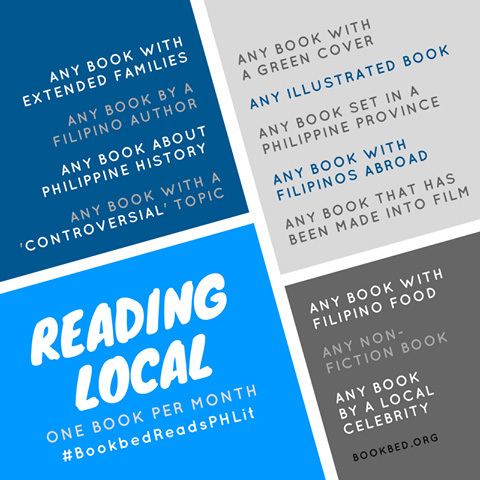 In this challenge, readers must choose one book by a Filipino every month throughout the year. Check out our picks for May below! What I liked: The reason I bought Strange Natives back in April was that the artist behind the booth selling local comic books recommended it, saying it would make me feel empowered as a woman. And that’s what you get even in the first few pages of the story, which centers on Grasya, an ageing woman who sells antiques in a forgotten town in the Philippines. Much like the furniture and house and town surrounding her, Grasya is filled with a past that can’t seem to set her free (or maybe she’s the one who refuses to let it go) and is constantly bombarded with her memories, both good and bad. It is through these flashbacks that Grasya’s history is revealed, the joys of her childhood and the suffering of her adult years, and in each stage of her life, Grasya is shown as a woman of strength and intelligence, even before she discovered the full extent of her powers. (Spoiler alert! Highlight text to read.) And those pages portraying Grasya destroying basically a battalion of Japanese soldiers that killed her family was, for lack of a better word, flippin’ awesome. Though the book is short, I feel like there is so much more to explore in Grasya’s story (Memory in a Doctor Manhattan-ish form; that photo of Grasya and her “friends”) but I’m also already satisfied with how it ended. I wouldn’t mind, however, buying other books related to this universe. The art, too, is incredible and at times haunting, the black and white lending itself well especially on the more morbid and dramatic scenes. I wish I could say more about the illustration but I don’t have anything else except that it really is beautiful and I wish I had a digital copy of the book so I can better appreciate certain spreads without straining, and possibly ruining, the spine of my paperback from stretching it too much. “‘It’s because of the blank space!’ Son burst out. I shot him an empty gaze. Read all #BookbedReadsPHLit Reports here.